The idea started with Henry Frondorf, who won the first ever Engage Cincy Grant for the Neighborhood Games in 2016. He says his inspiration for the Neighborhood Games started as a spark when he attended the Men’s World Cup Match viewing party on Fountain Square in 2014. The Neighborhood Games are a series of events where teams from each neighborhood compete to win the Neighborhood Cup. The events mirror the Olympics where there are an opening and closing ceremony. After his first Neighborhood Games, he realized that not all neighborhoods have a representative flag. Left to right: Henry Frondorf, Josh Mattie, Chris Cliff-Perbix. Because of this, Frondorf, along with designers Josh Mattie and Chris Cliff-Perbix, came up with the idea to instill a sense of place in each Cincinnati neighborhood through a flag. They applied this idea to the Engage Cincy Challenge Grant Program were chosen from seventeen finalists to receive $10,000 from the city for this initiative. “You’ll get feedback from people who respond saying that what is most important about their neighborhood is that they’ve lived there for forty years and all the connections they’ve made through that. That is hard to represent, and we are trying to physically represent that feeling,” said Chris Cliff-Perbix. 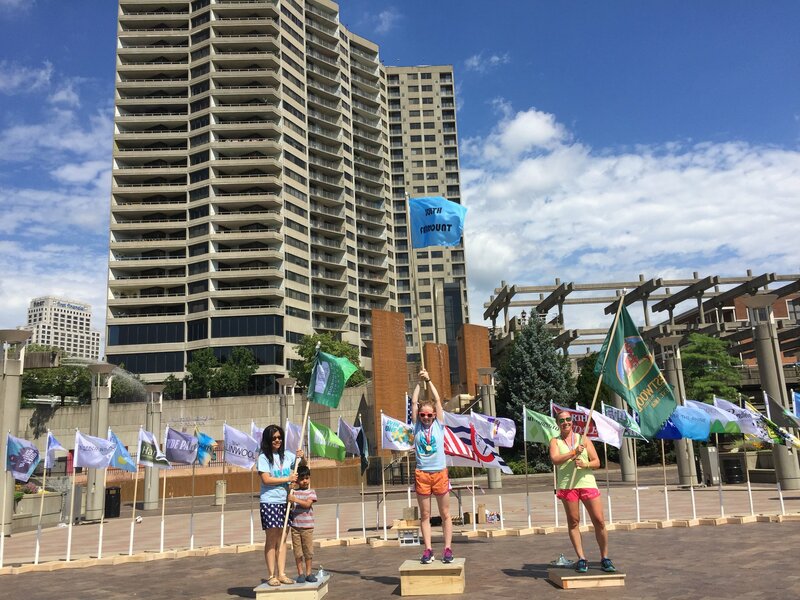 The flags were flown at the Parade of Neighborhoods Opening Ceremony at the Neighborhood Games in 2019. This year’s Neighborhood Games Opening Ceremony was July 21 at 7 p.m. at Washington Park. While the third Neighborhood Games is in the books you can still tell Cincy Flags what you love about your neighborhood by filling out the survey here.